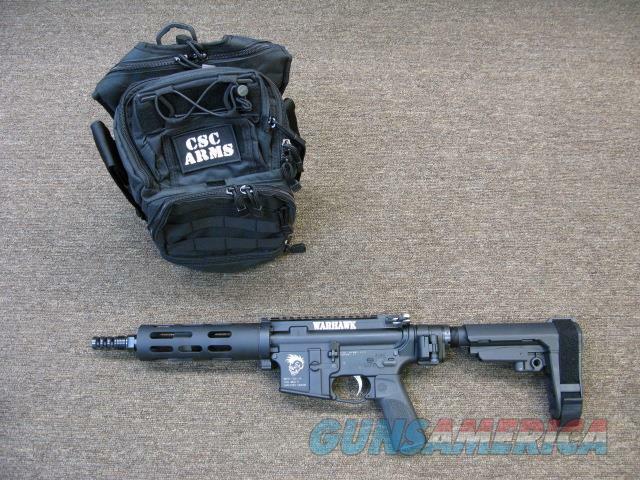 Description: CSC ARMS "WARHAWK" TAKEDOWN 300 Blackout AR Pistol 8". This is the Solution for First Responders, Law Enforcement, And Armed Security. Every Day Carry Back Pack to respond to Active Shooter. Comes with 10" Back Pack. Also can be ordered in 5.56/.223. Folding Stock And Take Down Barrel Feature. There is NO company that has a Flat shooting AR Pistol like this in the industry. NO movement for .30 caliber in short barrel pistol. CSC 7075 Forge aluminum receivers with QD mount on rear of receiver. CSC 8" 300 Blackout 4150 steel black nitrided coated 1/8 twist pistol length gas system. CSC 3 port muzzle brake. CSC Nickel Boron bolt carrier group. CSC Nickel Boron charging handle and Nickel boron trigger group. CSC 7" hand guard. SB Tactical Brace. Comes with one 30 round magazine. This is a great small compact gun total weight is 5 pounds and length 24". Any questions contact CSC ARMS. CSCARMS.COM. Flat rate shipping $40.00.